Dicework I: Meta-Ruleset 24 May 2008. 2008. Before starting a dicework, let the die determine which type of ruleset is to be used. Roll as many dice needed so that each potential unique numerical result corresponds to one numerical entry in a list of all the colours of paint in possession of the artist, where each tube of paint of a specific colour is assigned a unique number. The colour of paint selected by the dice will be used exclusively throughout the day in the execution of diceworks based upon rulesets that instruct on the use of paint. If the numerical result of a dice roll exceeds the number of tubes of paints listed, roll the dice again. Repeat if necessary until an outcome numerically corresponds to a listed tube of paint. 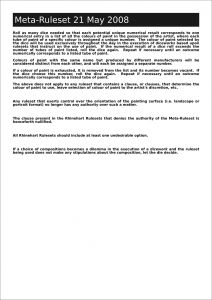 Colours of paint with the same name but produced by different manufacturers will be considered distinct from each other, and will each be assigned a separate number. 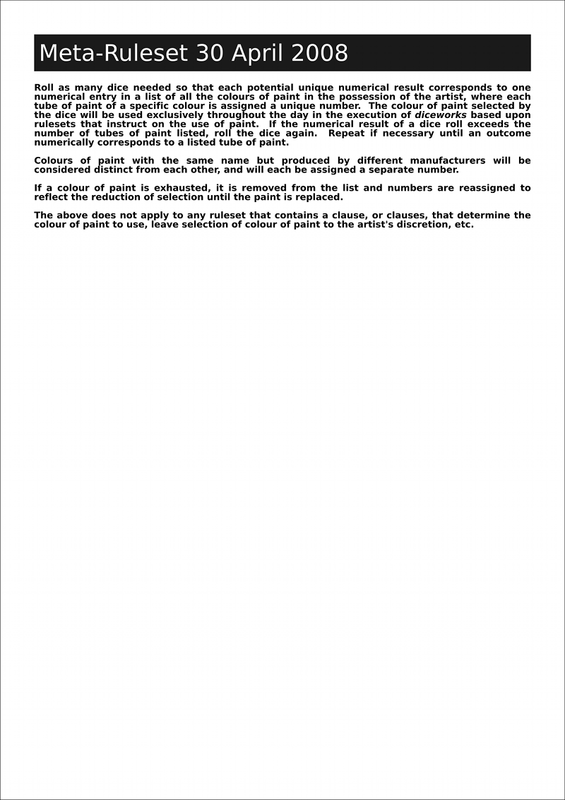 If a colour of paint is exhausted, it is removed from the list and its number becomes vacant. If the dice choose this number, roll the dice again. Repeat if necessary until an outcome numerically corresponds to a listed tube of paint. 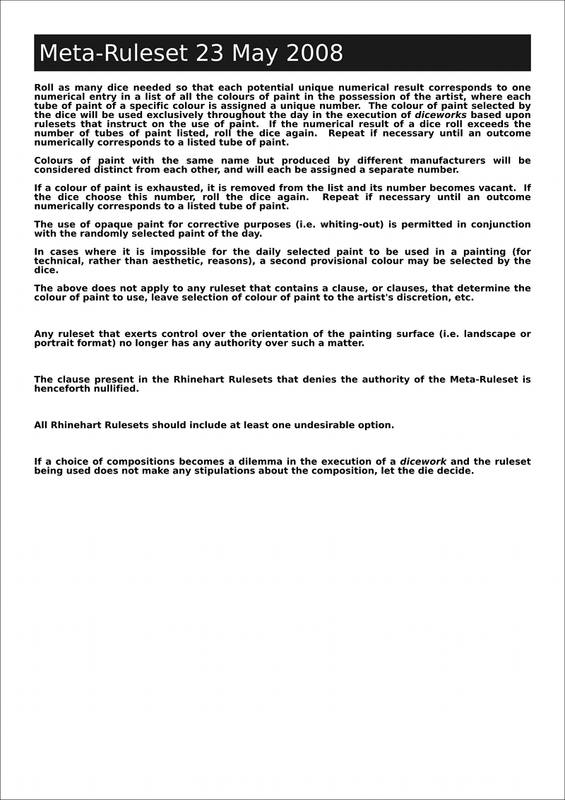 The use of opaque paint for corrective purposes (i.e. 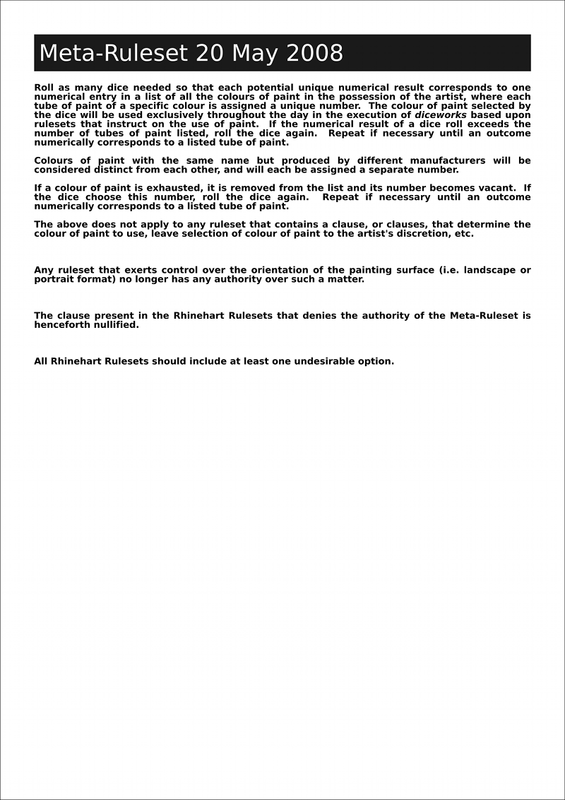 whiting-out) is permitted in conjunction with the randomly selected paint for the day. 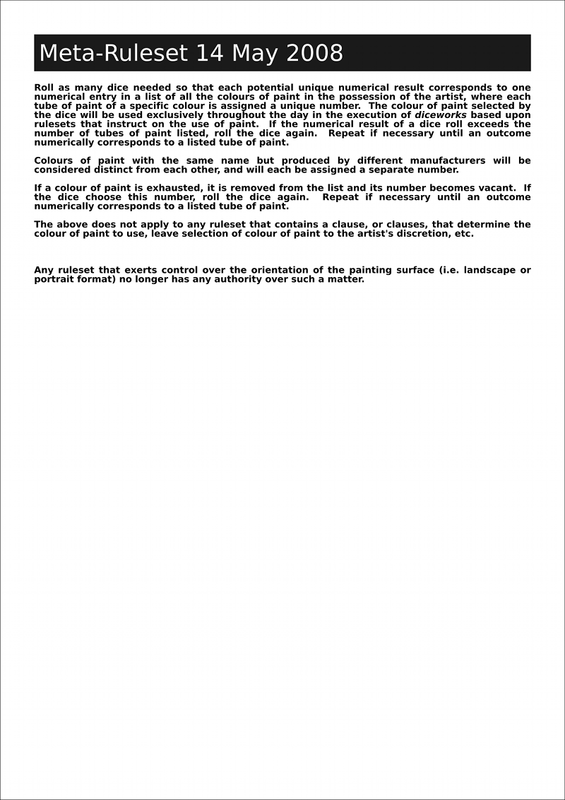 In cases where it is impossible for the daily selected paint to be used in a painting (for technical, rather than aesthetic, reasons), a second provisional colour may be selected by the dice. 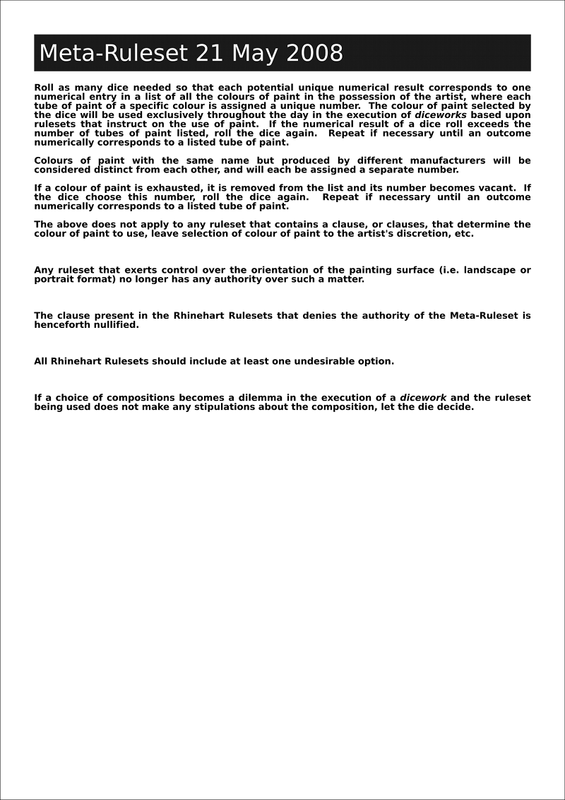 The above does not apply to any ruleset that contains a clause, or clauses, that determine the colour of paint to use, leave selection of colour of paint to the artist’s discretion, etc. 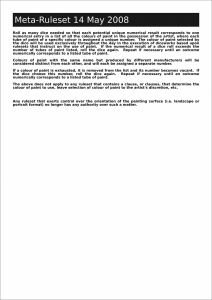 Any ruleset that exerts control over the orientation of the painting surface (i.e. 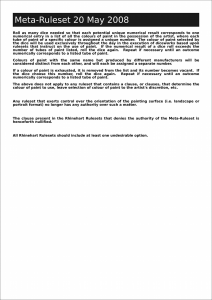 landscape or portrait format) no longer has any authority over such a matter. The clause present in the Rhinehart Rulesets that denies the authority of the Meta-Ruleset is henceforth nullified. 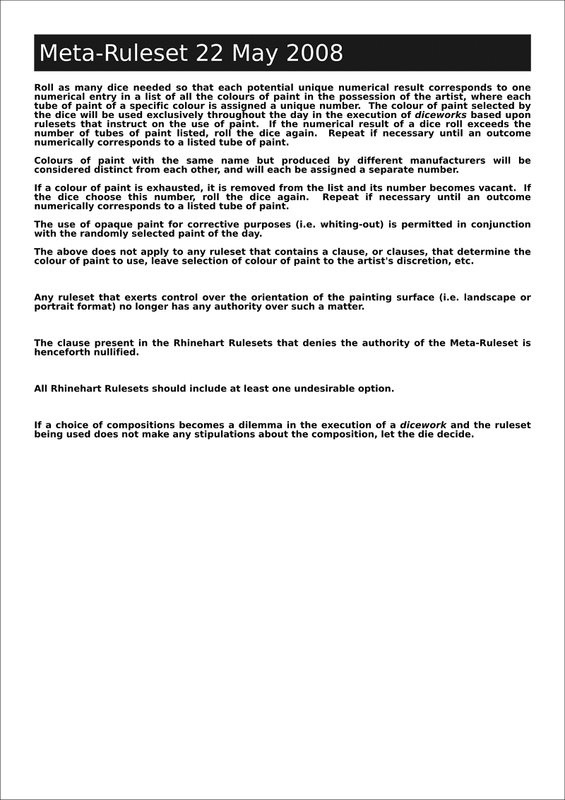 All Rhinehart Rulesets should include at least one undesirable option. 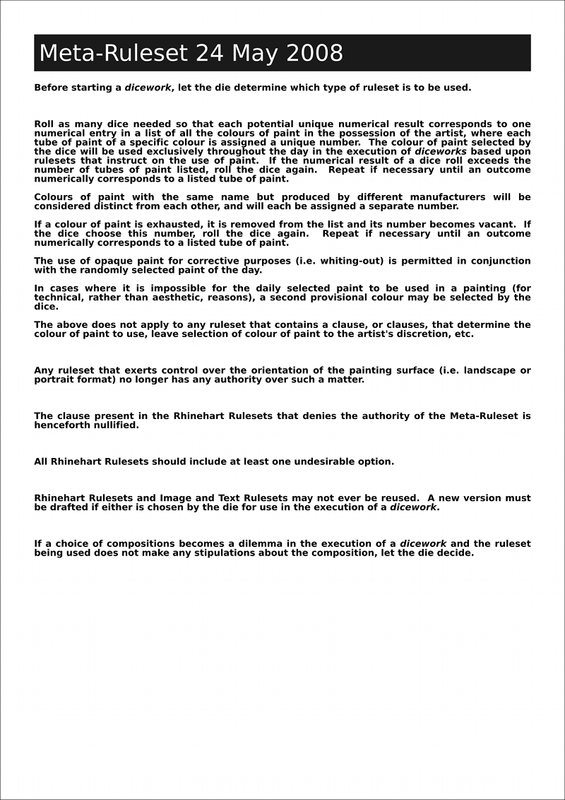 Rhinehart Rulesets and Image and Text Rulesets may not ever be reused. 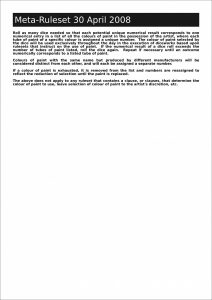 A new version must be drafted if either is chosen by the die for use in the execution of a dicework. 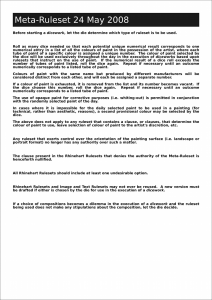 If a choice of compositions becomes a dilemma in the execution of a dicework and the ruleset being used does not make any stipulations about the composition, let the die decide. Dicework I: Meta-Ruleset 23 May 2008. 2008. Dicework I: Meta-Ruleset 22 May 2008. 2008. Dicework I: Meta-Ruleset 21 May 2008. 2008. 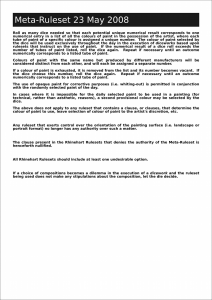 Dicework I: Meta-Ruleset 20 May 2008. 2008. Dicework I: Meta-Ruleset 14 May 2008. 2008. Dicework I: Meta-Ruleset 30 April 2008. 2008. 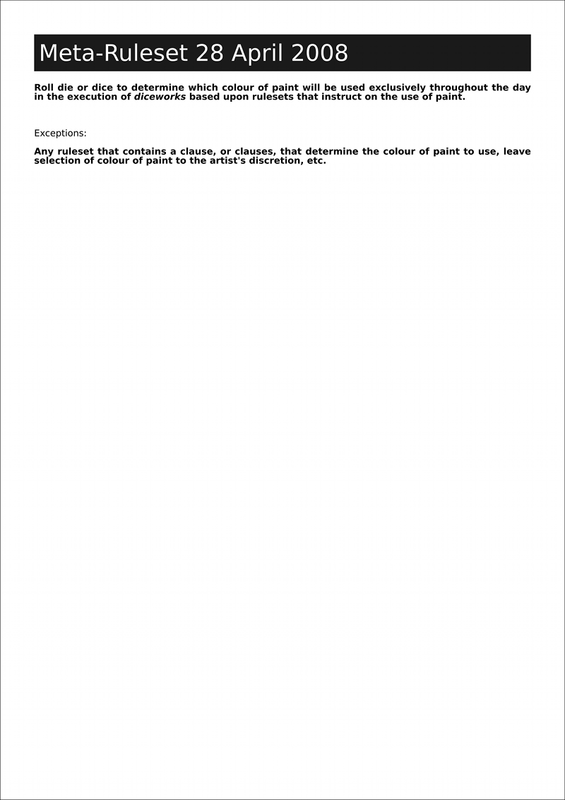 If a colour of paint is exhausted, it is removed from the list and numbers are reassigned to reflect the reduction of selection until the paint is replaced. Dicework I: Meta-Ruleset 28 April 2008. 2008. Roll die or dice to determine which colour of paint will be used exclusively throughout the day in the execution of diceworks based upon rulesets that instruct on the use of paint. 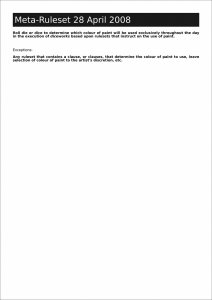 Exceptions: Any ruleset that contains a clause, or clauses, that determine the colour of paint to use, leave selection of colour of paint to the artist’s discretion, etc.